There are various factors that determine what type of bitcoin trading to pursue. Such factors may range from time horizon and risk tolerance to your style of analysis and your expectations of what bitcoin trading may* lead to. If you’re still unsure about the essence of bitcoin trading, we recommend that you take a look at our academy article on what is bitcoin trading. The time horizon over which someone plans to hold their coins is closely related to their chosen trading method and how much time they can dedicate to bitcoin trading. It is also closely intertwined with risk tolerance. Risk tolerance is important to consider before purchasing assets and entering the bitcoin trading market. It’s crucial to conduct a thorough financial analysis to get a genuine understanding of what potential losses you are able to tolerate through bitcoin trading. Like other types of trading, bitcoin trading comes with its own risks that must be taken seriously. Additionally, risk appetite varies from person to person, and it’s important to familiarise yourself with the “what ifs” to help guide your asset management and bitcoin trading strategies. Nevertheless, while you can attempt to mitigate risks, their potential cannot be eliminated completely when engaging with speculative financial markets. Furthermore, your style of analysis may influence how you plan to trade bitcoin. There are two overarching schools of analysis within the fields of trade and investment, namely, fundamental and technical analysis. Fundamental analysis examines the bigger picture surrounding an asset and derives conclusions accordingly. The intrinsic value of an asset is found through an evaluation of the key price determinants’ (fundamentals’) health. Different types of fundamental analyses are conducted for different types of assets. Using fundamental analysis for bitcoin trading is considered more complicated than its usage for other sets of financial assets. That’s because other financial assets have clear performance indicators, e.g. a company’s balance sheet. Moreover, when analysing a company, or an industry, there are financial statements and sheets that help with finding the value of an asset. Within bitcoin trading, those undertaking fundamental analysis might focus on the Bitcoin community, technological developments, use cases and the overall market sentiment. A vital determinant in analysing bitcoin’s value is its future scalability. Protocol improvements, like the Lightning Network are needed to maintain bitcoin’s usability, and thus, its value as a method of payment and means of exchange. Technical analysis is a trading discipline used to identify trading opportunities by utilising statistical data evident in past trading activity. It focuses on patterns in price movements that evaluate an assets strength or weakness. Different movements in an assets price over specific intervals of time result in analytical charting tools and trading signals influencing the behaviour of traders. Technical analysis is built around the assumption that price movements are not purely random. Instead, moves in trends and identifiable patterns tend to repeat over time. By analysing quantitative data derived from price movements in the past, it attempts to forecast price movements in the future. Within bitcoin trading, technical analysis can be useful in terms of knowing when to HODL and avoid the FUD. This method has become significantly more popular in recent decades due to the expansion of global financial markets and tradable assets as a whole. The increase in its use by traders and investors has driven the development of hundreds of uniquely different indicators and strategies that can be applied across financial markets. When investing capital into any market it is imperative to first conduct thorough research. Both fundamental and technical analyses are used to forecast future trends in price action, but each have their own limitations. When undertaking fundamental analysis, it’s always vital to be aware of potential bias within the sources that you draw conclusions from. This is especially important when it comes to undertaking a fundamental analysis for bitcoin trading. Unlike how it is for other tradable assets such as stocks, the key price determinants for bitcoin’s health are largely qualitative. Likewise, even though technical analysis may seem more scientific or quantifiable in the case of bitcoin trading, it is still subject to heavy interpretation when applied to any tradeable asset. Nonetheless, the two approaches do enable traders and investors to assess the value of an asset. And, in spite of their philosophical differences, it’s worth undertaking both styles of analysis to obtain a more thorough understanding of markets. For example, an individual may use fundamental analysis to identify an asset that is undervalued in the market, and then, utilise technical analysis to specify where they will enter and exit a trade. It is truly a composite of both these approaches that enables the pursuit of profit, while simultaneously hedging against risk. There are various methods to follow or mix and match to help in the pursuit of profit through trading markets. Below, we mention some ways to trade bitcoin. Though, there are also many more detailed and evolving strategies to track changes in the different trade markets. Day traders pursue small gains from low price movements as they tend to execute multiple trades over the course of a single day. Day traders typically set more conservative targets ranging anywhere from 1-5%. However, targets are always relative to price action, and as a result, profits can exceed these ranges. As illustrated in figure X below, effectively executing day trade(s) is an activity that requires diligence and attentiveness. Day traders tend to pursue small profit margins, but also apply small levels of risk tolerance. Scalping is another bitcoin trading strategy that involves high-frequency trading, with the potential for hundreds of trades in a single day. The focus lies on maximising profits and minimising risks as a result of the large spread of smaller trades, performed based on low price movements. Swing trading follows a more medium-term approach in contrast to day trading and scalping. Swing traders place their focus on the larger picture by observing the natural curving (swings) in price charts that occur over time. That approach means that swing traders can spend much less time on trading than those involved in “normal” day trading. To put it simply, they are more focussed on the macro movements in price charts, as opposed to day traders focus on the micro. Figure Y below illustrates a bitcoin swing trade. An individual would place a buy order where BTC price is low relative to its recent price action and is near a level of significant support. The trend presumably reverses and starts an upward movement. The individual will stay in their long position until there is a noticeable change in trend direction. Some bigger exchanges like Kraken, Binance and Bitstamp allow for users to place different types of bitcoin trading orders. Below, we explore the most common order types. Market orders are the beginner’s go to order type and ensure that an order gets filled/the trade closes. They are the most widely accessible and easily understood type of trading order. A market order requires a trader to pay the market price when buy or selling their assets, which implies that the trader pays the price as determined on the bitcoin exchange(s) they use. Market orders are frequently utilised amongst those who heavily trade liquid stocks. Limit orders lock in your bitcoin trades at predefined prices that you want to buy or sell at. 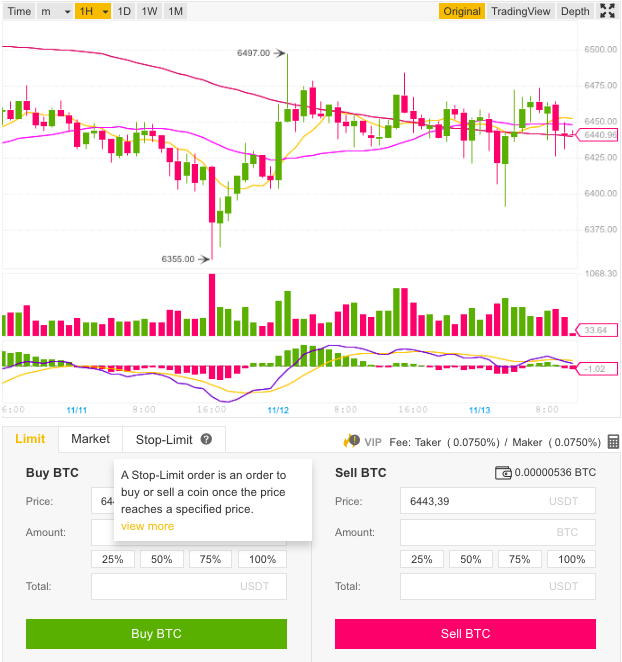 For example, you can pre-select your trade so that you buy a certain amount of bitcoin when it is worth €6,000 and sell half of your position when it costs €8,200 The buy orders are only executed when the price of bitcoin matches or is lower than your limit, and sale are processed only when the price reaches or exceeds your limit. Stop orders can used as a protection mechanism when it comes to selling bitcoin. You can set a limit to sell your coins if the price drops in order to minimise your losses/maximise your profits. Stop buy orders create a situation in which you buy bitcoin at a cost above the market price only at a future point when the price rises. *When your stop order get filled, you pay the given market price at the time the order is filled. Stop limit orders may be a safer option than stop orders due to the in-built price limit. Just like stop orders, they become buy or sell orders when a certain price is reached. However, the trades are still determined by specific limits that act as further protection mechanisms to only execute the trade at the limit price or better. 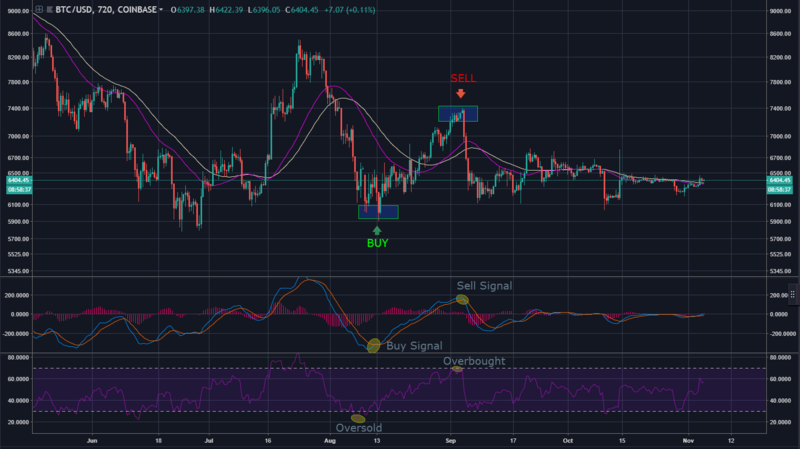 For example, if you arrange a bitcoin buy order at €6,700 stop and €6,800 limit, the order will only succeed if the market price reaches or surpasses €6,700, but not higher than €6,800 within the day. While these orders offer security, there is a greater likelihood that they may not be performed. There are many other types of orders like trail stop and trail stop limit orders that exchanges may offer, however the above mentioned orders are employed most commonly. 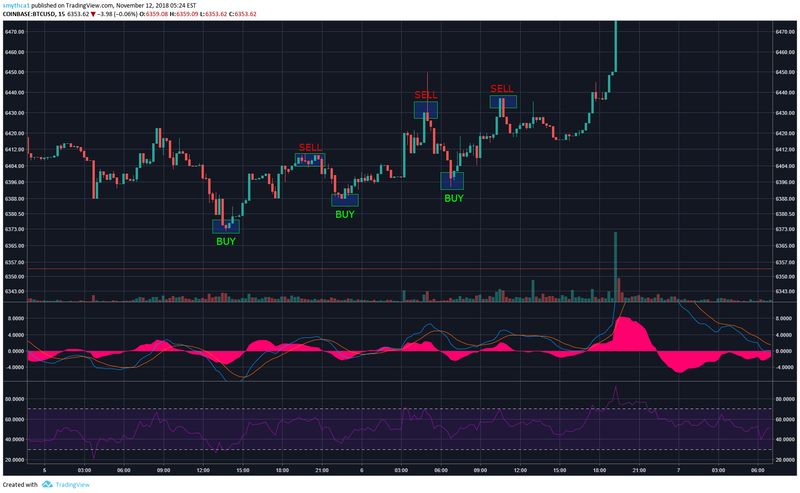 Amongst the various methods of trading, different types of orders, and strategies of analysis, there’s a lot to consider before getting involved. Perhaps it will take some time before you can call yourself a bitcoin trader. But, if you’re dedicated to crafting a cautious, well-thought out methodology for your entrance into the world of bitcoin trading, you might just get to enjoy some of the perks of being part of the revolution. The bitcoin revolution centres around a primary goal to create a way for individuals across the world to transact value amongst each other without the involvement of a third party. The revolution will be realised with the mass adoption of bitcoin as both a method of payment and a store of value. Nonetheless, the trading of financial assets is inevitable - just as foreign exchange is traded, bitcoin and other cryptocurrencies are also traded. The nature of humans to speculate gave birth to the pursuit of profit in the form of exchanging assets. However, in simple terms, trading is like gambling. Although attempts can be made to premeditate price movements and bet on the value of an asset, the outcome of your capital investment cannot be guaranteed. The opinions expressed in this article are those of the author and are not intended as financial advice. Investing in cryptocurrencies is highly speculative, the value of bitcoin and other cryptocurrencies is determined by the market. Thus, their value cannot be guaranteed and should never be understood as fixed, since there is a strong potential to incur losses as a result of volatility. If you are considering getting involved in bitcoin trading, we strongly recommend that you consult an investment expert and/or tax advisor.